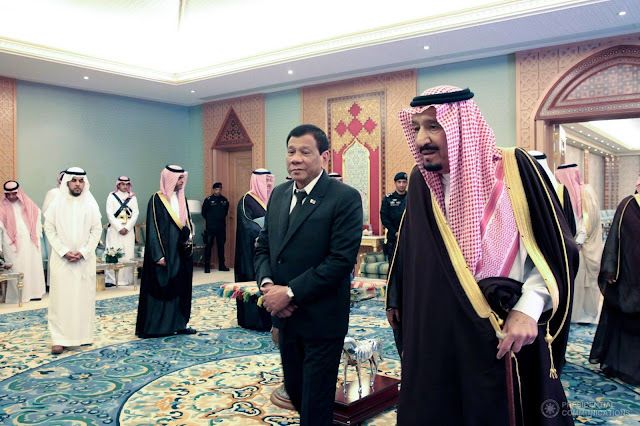 RIYADH, Kingdom of Saudi Arabia, April 12 (PNA) -- President Rodrigo Roa Duterte led Philippine officials in a courtesy call on King Salman Abdulaziz Al Saud at His Majesty’s private residence. It is the first time in eight years that a Filipino leader was received in a state visit to the Kingdom of Saudi Arabia (KSA). 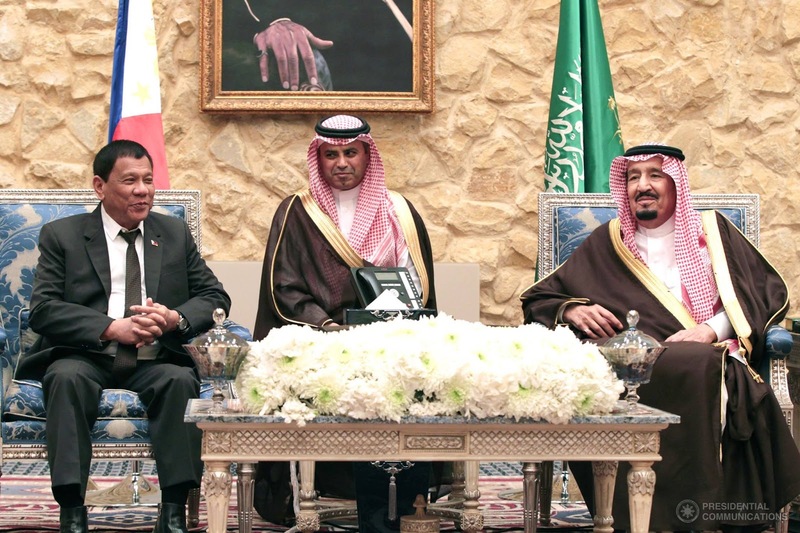 The President thanked King Salman for hosting Filipino workers in the country. The Saudi king, in turn, thanked President Duterte for the Philippines’ contribution in providing professionals and other skilled workers for the Kingdom. Accompanying the President were Acting Foreign Affairs Secretary Enrique Manalo, Labor Secretary Silvestre Bello III, Defense Secretary Delfin Lorenzana, Trade Secretary Ramon Lopez, Transportation Secretary Arthur Tugade, and Energy Secretary Alfonso Cusi. Also in attendance were National Security Adviser Hermogenes Esperon, Presidential Adviser for Overseas Filipino Workers Abdulla Mama-O, Chairman of Mindanao Development Authority Datu Khayr D. Alonto, Philippine Embassy to KSA Chargé d’Affaires Imelda Panolong, Special Assistant to the President Cristopher Lawrence Go, and Senator Alan Peter Cayetano. After short pleasantries, King Salman introduced the Royal Family and Cabinet Ministers to President Duterte, and was reciprocated by the President who introduced his official delegation to His Majesty. Following tradition, everyone was offered Arabic coffee before the President and His Majesty were ushered to the lunch room followed by the Royal Family, Cabinet Ministers, and the Philippine delegation. After the official lunch, President Duterte and King Salman were escorted to the venue for the bilateral meeting and signing ceremony.